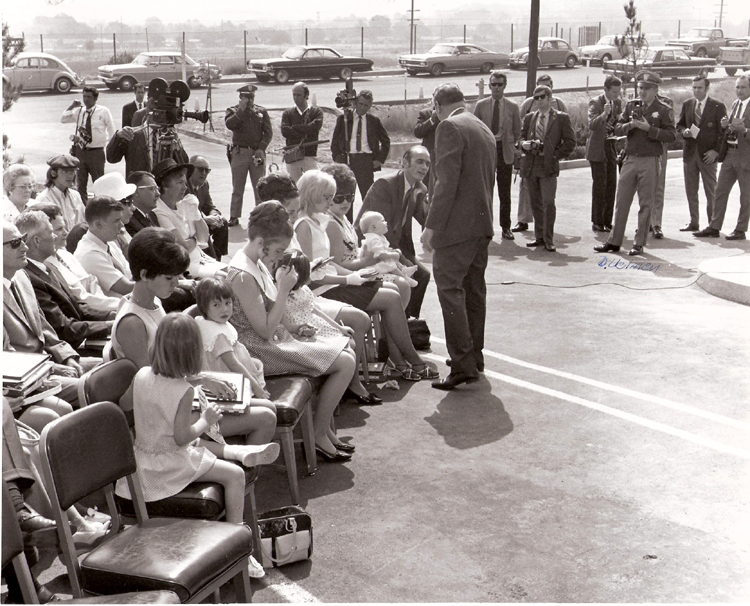 Photograph taken June 5, 1970, at the "Newhall Incident" Memorial Wall dedication at the Highway Patrol Office (located on the frontage road west of I5 and south of Lyons Ave). Photograph was printed in the May-June 1970 Highway Patrol publication "Zenith 12000" (emergency telephone number for the CHP prior to 911). Shows the four widows of slain officers Roger Gore, Walt Frago, James "Skip" Pence, and George Alleyn, with their children in the front row, and Gary Kness shaking hands with Herbert Ellingwood, legal affairs secretary for Gov. Ronald Reagan. Don Uelmen standing off to their left holding his Rolicord camera.